Woodstock for Capitalists is about to overtake Omaha this weekend, and I thought it was only appropriate to post about a company with a Berkshire tie-in. The company in this post falls into the same realm as Mills Music Trust, a simple concept where nuances make a big difference. The trust in question is Kiewit Royalty Trust (KIRY). The name might seem familiar with readers who know Berkshire's history, Kiewit is the name of the building Berkshire has their headquarters in. Kiewit Royalty Trust falls in the same category as a lot of little companies I look at, they're easy and quick to analyze, their annual report filed in March is only 14 pages long. The trust is simple, they own leases or lease interests in four coal mines located in the Powder River Basin area of Wyoming and Montana. Since Berkshire is a theme of this post it's only appropriate to mention that over 90% of Burlington Northern's coal originates from the Powder River Basin. I would presume something similar for Union Pacific the other large western railroad. The trust is a pass through entity, all of the royalty money from the coal mines gets sent straight off to shareholders. The trust doesn't have any assets other than cash waiting to be sent to shareholders, and their only liability is trustee fees to US Bank, and audit fees which are nominal. 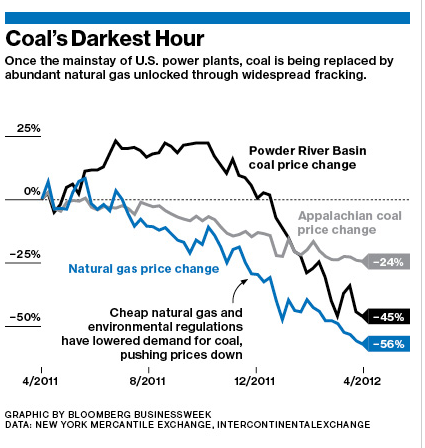 Buying a share in this trust is really a bet on the American coal industry. An industry that's isn't exactly a hot investment right now. Incidentally before I did this post I read this article in Bloomberg talking about coal's future in the US. The pivot point for this investment rests on the distribution which was $.19/sh in 2011, $.23 in 2010, and $.25 in 2009. If you start to look back at their previous 10-Ks it becomes apparently quickly that tons mined per year has been in steady decline. To further compound this is coal pricing has been weak at best. The following graph is from the above linked Bloomberg article. Pricing for Powder River coal is off 45% over the past year which in turn has hurt shareholders of the trust. The potential for an investment here is two-fold, the first is the current yield is 13%, the second is that if the price of coal recovers the trust's distributions per unit should increase. Of course the opposite is possible as well, coal could continue to be replaced by natural gas, and the commodity price continues to decline. One stat from the article I found really fascinating was that in 2008 Southern Co generated 70% of their electricity from coal, it's now down to 32%. There really isn't much to say about Kiewit Royalty Trust. As coal is dug out of the ground and sold on the spot market the money is sent off to investors. The current yield seems attractive but the prospect of further coal price declines, and declining coal usage in the US casts a cloud on the stability of payments. If history is any guide they will continue to decline unless prices make a strong recovery. I saw a segment on bloomberg tv while in the hotel room this week that raised an interesting point. While nat gas discoveries and extractions are making coal less desirable here, China india and Africa could be greatly increasing coal consumption until their energy distribution methods catch up for outlying areas. The premise was to not be overly concerned with decreasing us coal consumption and that the us is the saudi arabia of coal, soon to be exporting almost all of it like the saudis do with oil.